The BBC's Tom Burridge dines out at a Swedish fast-food chain that is trying to discourage people from eating too much meat by publishing the carbon footprint of each item on its menu. As soon as I am through the door of the brightly lit Max Burger restaurant in central Stockholm, spokesman Par Larshans insists I eat not one, but two of their fast-food snacks. I watch as burgers are assembled behind the counter by a line of workers and wrapped at an incredible speed. It's the illuminated menu, above their heads, that is the real reason for my visit. 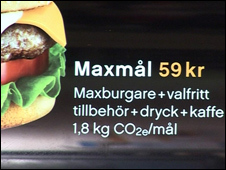 Max Burger claims to be the first restaurant chain in the world to publish CO2 emissions on its menu. From the methane produced by the cows, to the machinery used on the farm, through to the emissions produced by the abattoir and the lorries which move the meat around - the weight of CO2 represents the carbon footprint of that meal. Beef production emits high levels of carbon dioxide when compared to other foods. So why on Earth does a restaurant chain that sells mainly beef want to advertise how bad its products are for the planet? Par Larshans insists they are not "shooting themselves in the foot" and is quick to remind me of the "less-meat products" on the menu.